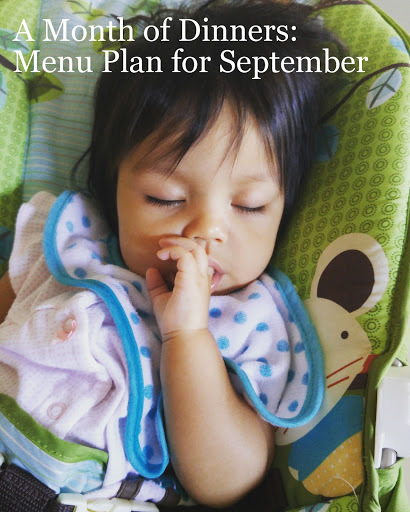 Make your month a little easier by planning all your meals at once. Over the past few weeks, I've been trying really hard to maximize the time I have when Caroline is napping. Each day, I pick a handful of tasks from my larger to-do list that I'd like to accomplish -- I call the shorter list my "Daily Five" -- and try and complete those things before I tackle anything else. Since I typically do a few loads of laundry per week, that's a task that can take several hours to do from start to finish. That means I can do that while doing something else, like handing off the baby monitor to Stephen so I can run a quick errand or tackling a photo-editing project so I have the images I need when I actually find the time to write a new blog post. I've also found that using the time while Caroline naps to prep ingredients for that night's dinner (or even the next night's) has been really helpful. That gives me time to clean up after myself (leaving Stephen fewer dishes to clean up after we're done eating) and makes the idea of cooking meals less exhausting. And, somehow, knowing that I can find time to cook healthy meals from scratch with a baby in the house makes the task of planning our meals seem more like fun rather than like work. Especially now that I've started planning a month's worth of dinners all at once. While I didn't stick to the original plan for August, it was super easy to shift things around to accommodate Stephen's last-minute work trips and unexpected visits from family. Here's hoping September goes as smoothly! Now, without further ado, here's our menu plan for the month! Do you plan your meals? What's on your Menu Plan for this week/month? Let me know in the comments!